Installing a shower timer in your bathroom is an excellent way to save shower water. 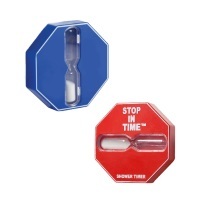 This water proof 5 minute sand Shower Coach timer from AM Conservation is easy to install. Simply affix the suction cup on the back of the shower timer to the wall. When you start your shower, rotate the shower timer so that sand start to flow. When the sand has stopped flowing, your 5 minutes is up.